By the end of March 2019, it is estimated that there will be 14 hospitals in Guangdong deploying the AI cameras, which were co-developed by Baidu and Sun Yat-sen University. The hospital became the first to use the device, co-developed by China's search engine Baidu and Sun Yat-sen University, to serve the general public. The instrument is capable of diagnosing three types of fundus disorders -- diabetic retinopathy, glaucoma and macular degeneration. It scans the eyes and generates a report in 10 seconds, all done without the need for an ophthalmologist to be present. Baidu’s AI-powered camera was first unveiled in China in November 2018, according to a MobiHealth News article. Fundus diseases are a major cause of blindness in the developing world, where the short supply of eye doctors and instruments has stymied timely diagnosis and treatment. China, with a population of 1.39 billion, has only thousands of ophthalmologists capable of analysing fundus photos screening. “As a doctor working at the grassroots level, I believe AI can greatly help in all aspects of screening. For instance, there is so much imaging data during medical checkups and it takes up a lot of time and energy for doctors to physically look at this data, which is simply not efficient. In ophthalmology, the use of AI to verify test results from fluorescein angiography and OCT examinations can help doctors expedite their analysis, which saves time and improves their efficiency,” said Dr Honghu Xia, Director of Ophthalmology at Deqing county hospital. "It is easy to use and can be operated by a non-professional. Its 94-percent sensitivity and specificity at analysing photos can match a senior doctor at a tertiary hospital," Xu said. 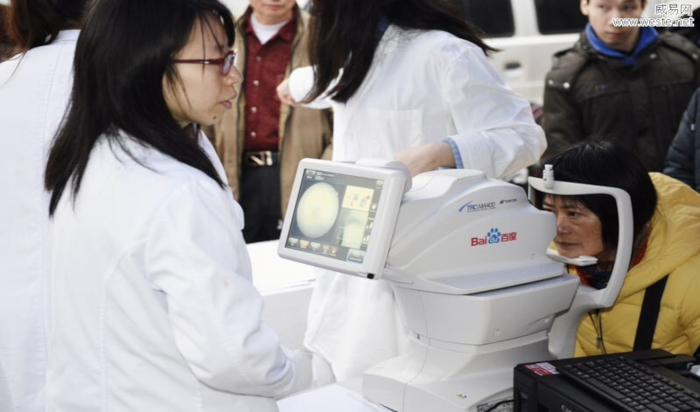 As of 10 January 2019, Baidu already has four of said AI cameras operating in four hospitals in Deqing County to assist ophthalmologists in fundus screening. It is estimated that by end of March, Guangdong Province will have 14 hospitals using the AI camera instrument.